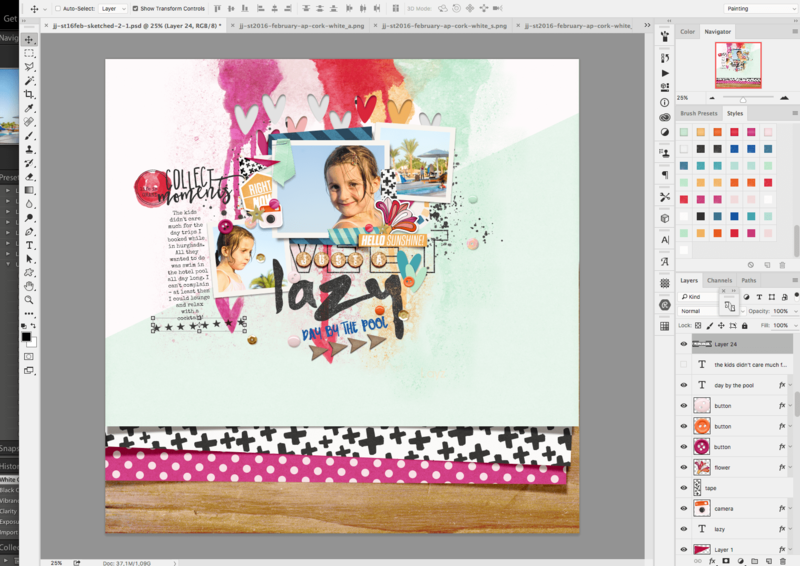 Digital Scrapbooking Tutorial – 10 Ways to make your templates NOT look like templates! I LOVE templates. I use them all the time to kick start my pages! 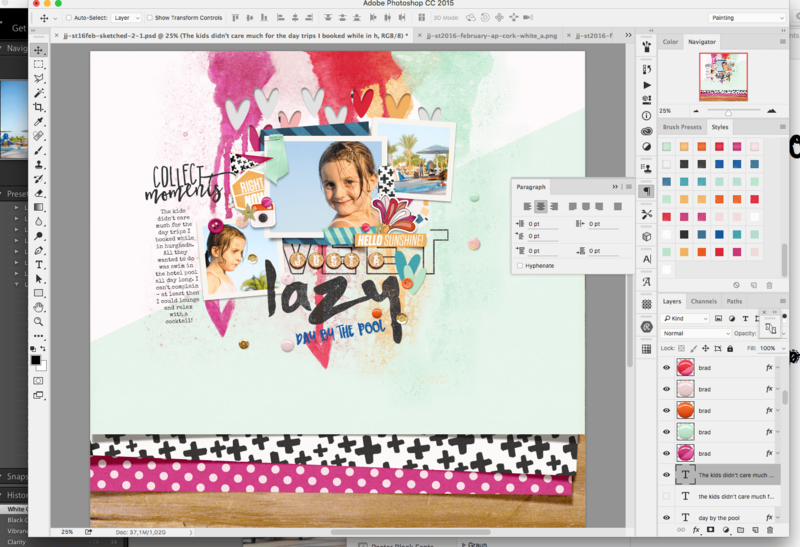 Some of us have mixed feelings about using them feeling that they somehow cheat the process of creating their layouts – but for me, I always use templates as a starting point! 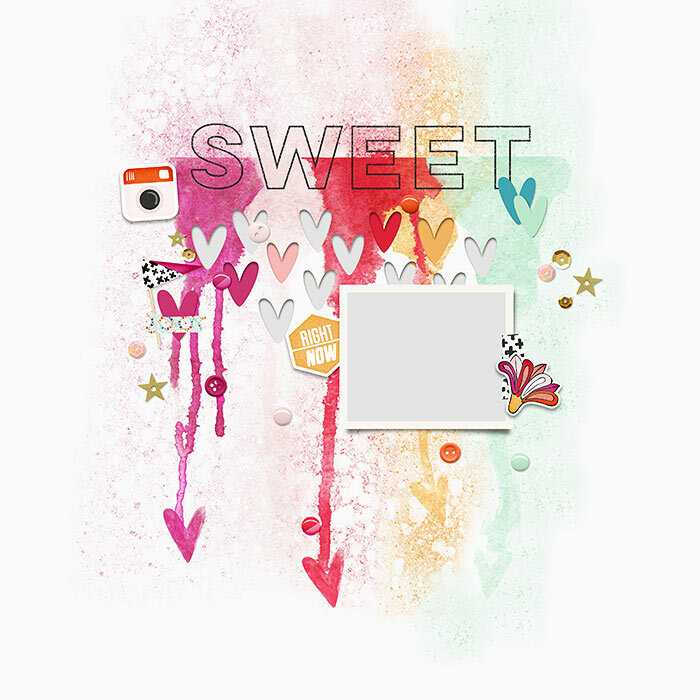 A foundation if you will for creating beautiful digital scrapbooking pages for my memory books! THERE IS NO SHAME IN USING TEMPLATES! So stop feeling guilty if you struggle with that! Let me give you some tips on how make your templates NOT look like templates! 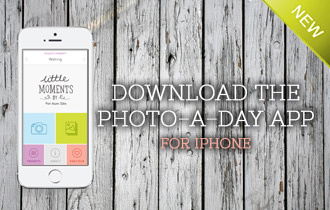 The first step is finding that perfect template for your photo(s). Browse through your stash and let your gut guide you. For me it’s easy. It’s like a template calls my name. For today’s template, I used a template from my Sketched Series featuring CTM Denny. I find this part really fun! You can move around the photo / papers.. anything really! Rotate your canvas / flip vertically.. anything is possible! Above I bumped the whole template to the top (background paper included) so the paint aligned with the top and brought the photo down. Here I took the above change and bumped my photo a bit more centered. 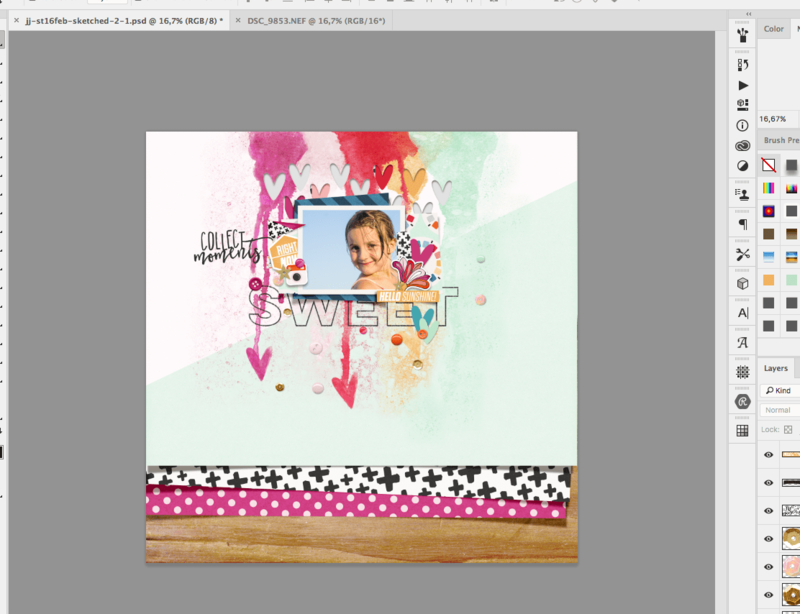 I also rearranged the elements around the photo and spread the dots and sequins around more evenly. I resized a number of them as well. As you can see in this template, there are no real paper masks. 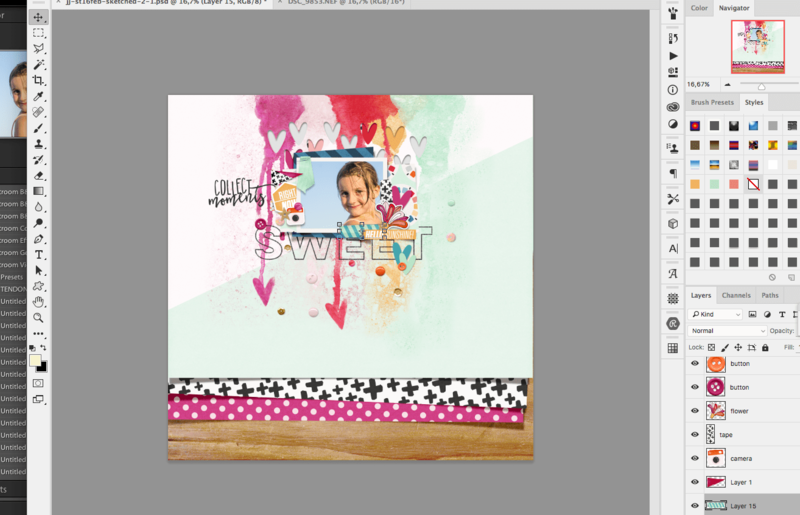 After I bumped the background up, I do have a block below but I think I want to add a couple of stacked papers at the bottom and also some stacked paper chunks behind the photo. Remember, custom shadows can really make a layout pop and look realistic! It’s starting to come together.. but we have a bit more to do yet! This is a big one. 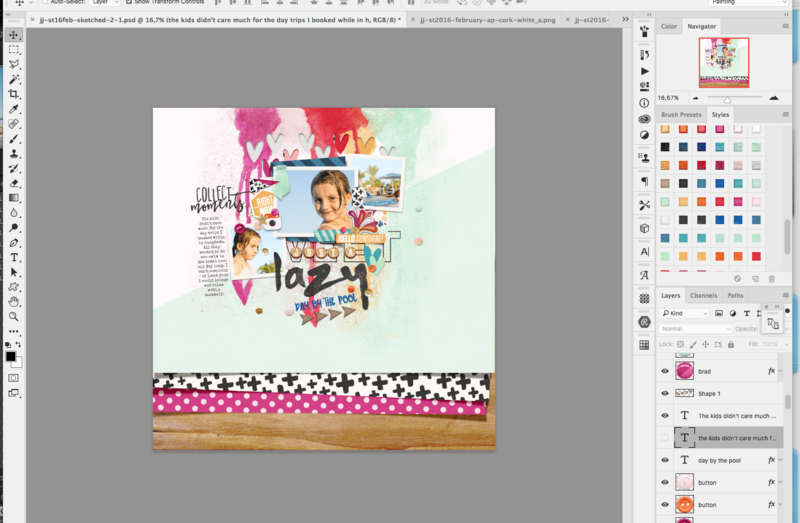 I love to use word art / strips to compliment my page with meaningful elements. For this page, I added a stamp *Collect Moments* on the left of the photo, and a Hello Sunshine strip on the bottom right of the photo. When I design templates, I personally stay away from clustering and the elements tend to be very minimal. I do this because this is something that I think scrappers should do in order to make their pages make sense to them (just like word art). 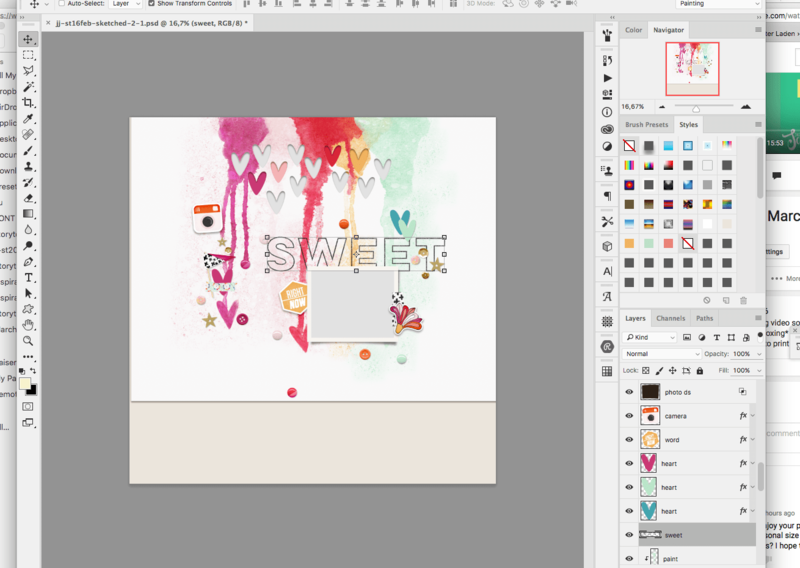 The template I used already had a number of elements included with it so it was already mostly done for me – I just used step one to rearrange and stack / resize as I saw fit for this page. So what I ended up adding was a stapled ribbon tab at the top left and a strip of tape on the bottom right of the photo. Sometimes you’ll be happy with the photo spots on the page, but sometimes you’ll want to add extra or take some away. 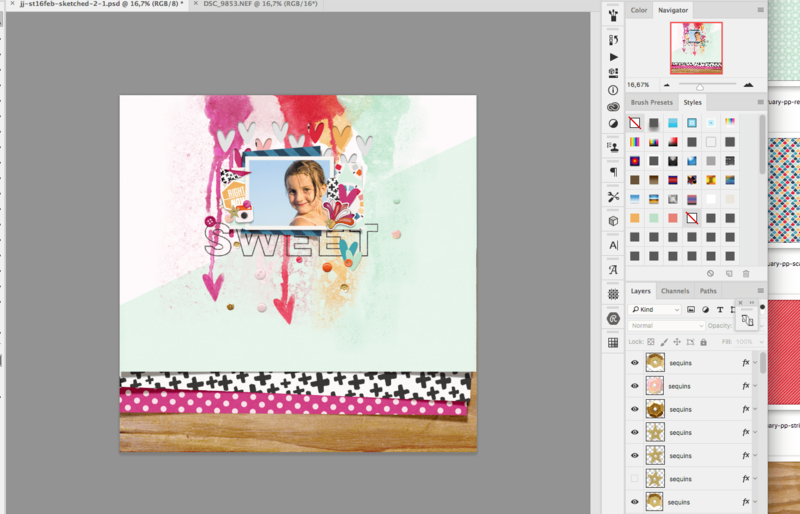 OR you could even change the shape of the photo by adding your own block shapes to clip them to. Below, I added 2 photos, 1 in the bottom left, 1 in the top right and tucked them in behind the main photo. I applied a frame style that comes with my photoshop Shadow Styles pack for my Storyteller subscribers. Here is the winner! I like the way I extended a vertical direction underneath the collect moments stamp. It looks neat and frames the centered area nicely! You can see above that I added some arrows under the *day by the pool* title. I also applied a chipboard style to them. I am a style addict! I make my own and buy many from different designers. For the February Storyteller I have a handy Styles pack which include epoxy, cardstock, chipboard, glitter and stamp styles. 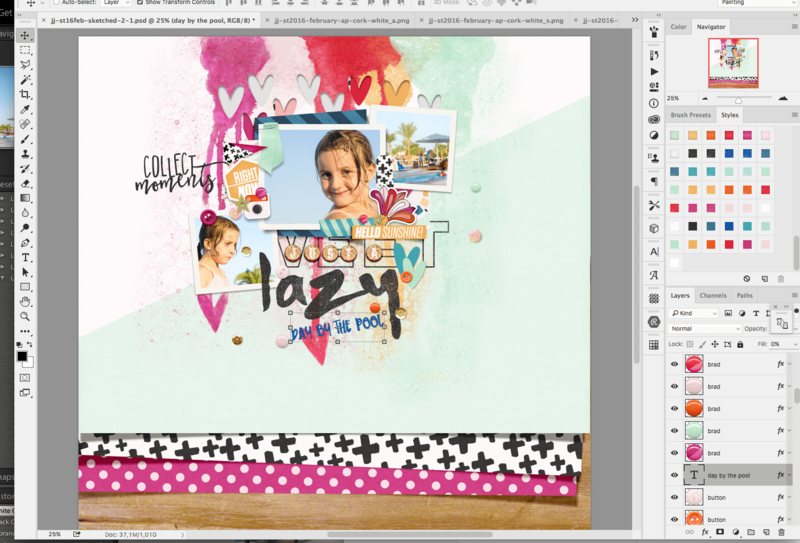 In the layout (and I did this in previous steps already) I added stamp styles to the titles stamps. I also added a chipboard style to my own arrow accent under the day by the pool. I HIGHLY recommend if you are a style girl like me or are interested in encorporating them into your layouts more to add unique elements, you much check out Mommyish! I use her styles religiously and she’s always coming up with cool and clever styles for everyone! You could use flair styles and make your own flair, veneer styles to make your own wood elements.. the possibilites are endless! This particular layout had plenty of paint so I was pretty much good to go. But I did add a star stamp under the journaling and a painted word art circle beside the collect moments AND black splatter paint behind the photos. 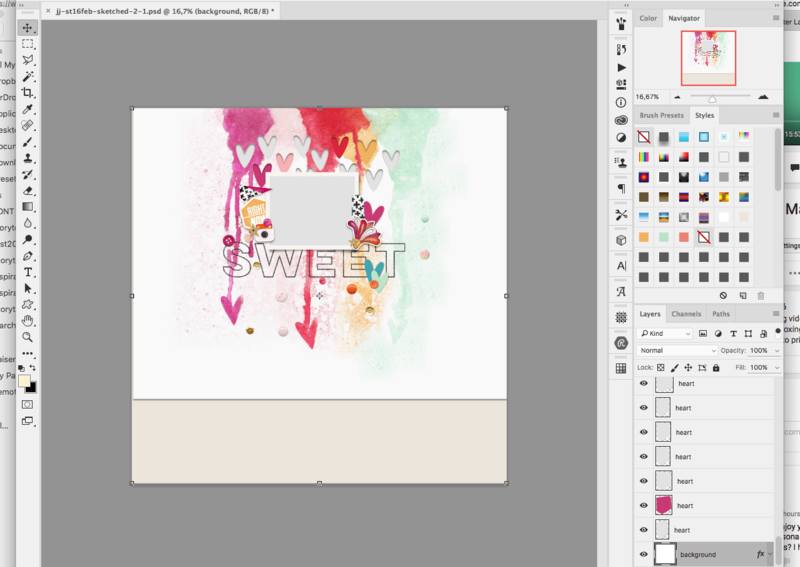 Paint and stamps can really look awesome on your pages – especially when they peak out behind your main elements. You don’t have to add a lot, but a little here and there can go a long way! Clearly not a minimalist method I used here though! I also add the paint and accents last because they should accent. In paper scrapping, you have to do a lot of planning and often times lay your paint down first and add stamps last – but digi (YAY FOR DIGI!) you can do this ANY TIME. So.. the before and after? Can you tell i used a template? Does it look like I created this from scratch or put a lot of effort into the page? – This page actually took me under 10 minutes to make by the way. What do you do to make your templates your own? 50% off today! NEW February A Stacked Mess + Stacked Frames! I love this tutorial – it sings to me. Seriously. For years I’ve been preaching to whomever will listen the wonders of templates and making them your own. This makes me so happy to see that a great designer is sharing this with the world!!! I learned a few ‘new to me’ ways of playing with templates – thank you so much! 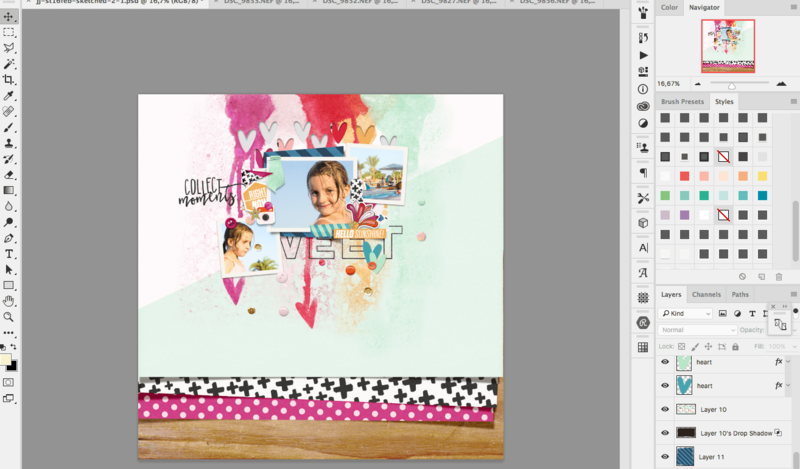 Definitely gonna share this with Luvy’s scrapbooking community! I’m so glad you liked it! Thank you for sharing with your community!